The symposium will take place at the main assembly hall of the University of Cyprus (area map, large view) at the Main Campus (campus map). Cyprus is located in the Eastern Mediterranean sea, and can be reached by several major international airlines from European or Middle East gateway cities. From North America, travelers can break up the journey in the European city of their choice, or elect to keep connection time to a minimum. Popular gateways include London, Paris, Amsterdam, Athens, Frankfurt, Zurich, Helsinki, Rome etc. From Asia, travelers can stop at Dubai, Haifa, Cairo, Beirut etc. Cyprus Airways provides regular daily flights from many major European and Middle Eastern gateways to the airports of Larnaca or Paphos in Cyprus. We recommend the airport of Larnaca's since is the biggest and the closest to Nicosia. 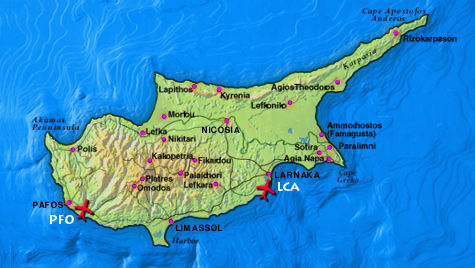 In Cyprus there are two International airports: Larnaca and Pafos. Most travellers reach Cyprus through the Larnaca International Airport. Flight time from London to Larnaca is 4.5 hours; from Frankfurt, 3.5 hours; from Athens, 1 hour and 35 minutes. A drive of about 50 km, 40 minutes, costing about CYP 25 (CYP 30 between 18:00 and 6:00 am). Taxis can be hired on your right as you exit the airport. For a Taxi Company, you can search this webpage and select ΤΑΧΙ at Category. There are scheduled bus rides by Intercity Buses to Nicosia, costing about CYP 5. Buses depart from the Airport at 6:25, 8:40, 10:40, 12:40, 14:10 and 15:40 on weekdays; on Saturdays there are no departures after 13:00, and there are no bus rides on Sundays. You can buy tickets on your right as you exit the Customs area, or you can call Intercity Buses at +357 24643492, +357 22643493 or +357 24722700. The bus terminal is on your left as you exit the Airport. For more information link on www.intercitybuses.com. Cars can be rented at the airport from most international rental firms at a cost starting around CYP 15/day. However, as in most former UK possessions, driving in Cyprus is on the left side of the road, using right-wheeled vehicles, and is not recommended for drivers unfamiliar with this practice. Cyprus, an island of legends that basks year-round in the light of the warm Mediterranean sun. A historic island, the third largest in the Mediterranean where modern travelers retrace the footsteps of figures as diverse as St. Paul, Alexander the Great and Leonardo da Vinci. Today Cyprus is a modern country that effortlessly marries European culture with ancient enchantment. You will discover a compact world of alluring beaches and fragrant mountain peaks, vineyards studded with olive trees and ancient ruins that stir the imagination, citrus groves and old stone villages. The people of Cyprus owe their individuality and warmth to the fact that they are the product of an amazingly colorful history. This sun-drenched island has been at the crossroads of world events for centuries. Roman, Byzantine, Greek and British influences (to name just a few) have all had a bearing on life in Cyprus. Perhaps that's why Cypriots have a special knack of making visitors feel at home as soon as they step off the plane or ship. That warm welcome, plus the unhurried pace of daily life, makes Cyprus an instant favorite of anyone who goes there. However, Cypriots managed to positively and creatively assimilate the foreign influences from all the invaders and to maintain unchanged the Greek language and the cultural heritage. In 1974 Turkey has invaded Cyprus and occupied the northern part of the Island. More than a quarter of a century after the invasion by Turkish troops, Cyprus still remains the only divided country in Europe. However, Cyprus can be proud of all its important achievements, the greatest of all being its accession to the European Union. With a modernized economy Cyprus is in position to be part of a new peaceful and prosperous Europe in which Greek and Turkish Cypriots together will be able to utilize the vast opportunities that membership offers. The challenge facing Cyprus is to ensure that both communities have a role to play in the future of the country. A viable and functional solution to the Cyprus problem will ensure human rights for all the Cypriot European citizens and this will guarantee security and well being. Typically, summers in Cyprus are quite hot. Temperatures in Nicosia in Janurary can be are about 24-30 C. For more information on cypriot weather is available online. Please note that participants from the USA, from Australia, from Canada and from Western Europe do not need a passport visa to travel to Cyprus. Participants from Syria, Jordan, the Arab Gulf (Aman, Quatar, Bahrain, Kuwait, etc) and countries of the former Soviet Union can obtain a visa upon arrival at Larnaca Airport after presenting a letter of invitation (to be issued by the conference organizing committee), a valid passport, a return ticket to and from Cyprus and information on local accommodation. If a visa is required for your country, then please visit the following URL http://www.mfa.gov.cy/mfa/mfa.nsf/EmbassiesList in order to find out your nearest cypriot consulate or embassy.